A scientist who faked his research may have actually made a groundbreaking advance - without even realising it. South Korean Woo Suk Hwang became famous after claiming to have extracted the world's first stem cells from a cloned embryo. It emerged he had lied about his work, and the source of the cells. But analysis in the journal Cell Stem Cell reveals he may have produced stem cells from human eggs alone - potentially even more useful. 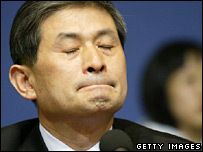 The Hwang episode, uncovered in 2005, is one of the most notorious scientific scandals of recent times. His work at Seoul National University earned him the status of national hero, and even led to his face appearing on a set of commemorative stamps. Hwang said that he had created cloned human embryos by placing the nucleus from the cell to be cloned into a "hollowed out" human egg, then managed to extract stem cells from the resulting embryos. Scientists are excited about the potential of stem cells because they are the body's "master cells", with the potential to become any cell type in the body, perhaps replacing those lost through ageing or disease. However, it later became clear that he had used eggs from young female researchers at his laboratory to create the embryos, itself a major ethical breach - and that the resulting stem cells did not come from cloned embryos. With his research discredited, he was dismissed from his post at the university, and charged with fraud and embezzlement. The latest twist came from the Harvard Stem Cell Institute in the US, who looked closely at his data, and found the cells were actually from a different type of embryo. Researchers said that the distinct "genetic fingerprint" of the stem cells means they may be the first in the world to be extracted from embryos produced by the so-called "virgin birth" method, or parthenogenesis. This happens when eggs are stimulated into becoming embryos without ever being fertilised by sperm, and has been achieved in animals. However, before Hwang, no one had managed to produce a human embryo using parthenogenesis which lived long enough to allow the extraction of viable stem cells. Dr George Daley, who led the analysis, told the BBC's Science In Action programme: "Unfortunately at the time they published their work they did not know what they had done so they had mistakenly isolated these parthenogenic embryonic stem cells, and yet misrepresented them as true clones. "In fact they had produced the world's first patient-specific embryonic stem cell, and that is very valuable. "Scientists interested in modelling complex diseases would like to be able to move a patient's own cells into a petri dish in their embryonic form." Professor Azim Surani, from the University of Cambridge, has carried out years of experiments to produce parthenogenetic stem cells from mice. He said Hwang had probably inadvertently stimulated the human eggs to begin dividing while trying to produce cloned embryos. Professor Surani said Hwang's unwitting step forward might actually prove more useful than efforts to clone human embryos, which he had claimed fraudulently. "I've always promoted the idea that efforts should be made to produce embryos from human eggs - it is far less ethically challenging, and the efficiency of these cell lines is likely to be higher than those produced from cloned embryos," he said. However, scientists do not know how significant the lack of contribution from the father's DNA will be.